This practical, down-to-earth book proves that we are surrounded by opportunities to impact our world and grow closer to God through the powerful means of intercessory prayer. Powerfully inspiring reading. From YWAM. 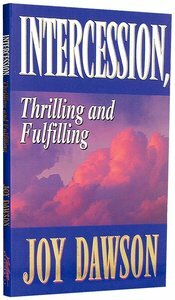 About "Intercession: Thrilling and Fulfilling"
This book proves that we are surrounded by opportunities to impact the world through the powerful means of intercessory prayer. Intercession, Thrilling and Fulfilling spells out the price of obedience but leaves us in no doubt that the rewards and fulfillment far outweigh that price. We become history shapers and closer friends of Almighty God. Joy Dawson has been traveling and teaching the Bible internationally since 1970. Her missionary journeys have taken her to more than fifty-five nations. A member of the US National Prayer Committee, Dawson is a recognized leader in revival prayer and intercession. She and her husband, Jim, live in Tujunga, California.